The International Court of Justice (French: Cour internationale de justice; commonly referred to as the World Court or ICJ) is the primary judicial branch of the United Nations. It is based in the (Dutch: Vredespaleis) in The Hague, the Netherlands. Its main functions are to settle legal disputes submitted to it bystates and to provide advisory opinions on legal questions submitted to it by duly authorized international branches, agencies, and the UN General Assembly. Established in 1945 by the UN Charter, the Court began work in 1946 as the successor to the Permanent Court of International Justice (1922-1945). The International Court of Justice adopted the seal of the Permanent Court of International Justice. The Statute of the International Court of Justice, similar to that of its predecessor, is the main constitutional document constituting and regulating the Court. Chapter XIV of the United Nations Charter authorizes the UN Security Council to enforce Court rulings. However, such enforcement is subject to the veto power of the five permanent members of the Council, which are China, France, Russia, United Kingdom and United States. 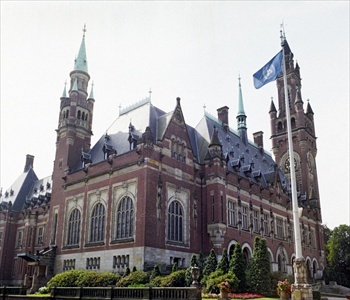 The International Court of JusticeIt uses the UN flag as seen outside their main office, the Peace Palace ("Vredespaleis") as seen here and here.